Netanyahu gaining momentum, new poll shows, tying Gantz-Lapid while right-wing bloc continues to rise. 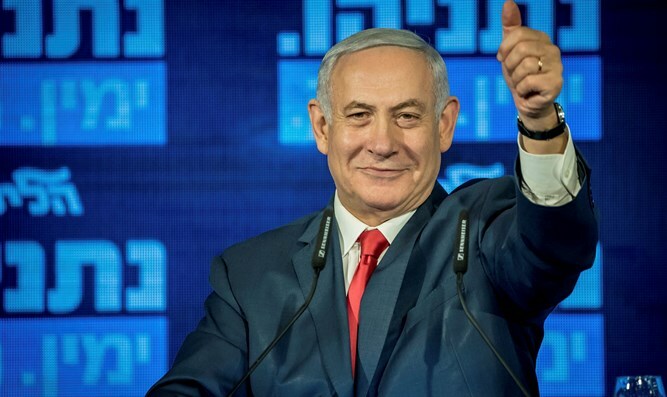 The Likud party has pulled into a tie with the Blue and White party, according to a new poll, as the right-wing – religious bloc opens up a wider lead over the left-Arab bloc. The new poll, conducted by the Midgam polling firm’s Mano Geva and veteran pollster Mina Tzemach on behalf of Channel 13, gives the Likud 30 seats – identical to the number the center-left Blue and White party is projected to win. As a whole, the parties affiliated with the Israeli Right or the haredi bloc – the Likud, Union of Right-Wing Parties, New Right, Shas, United Torah Judaism, Kulanu, Yisrael Beytenu, and Zehut - would win a total of 64 seats if new elections were held today. The left-wing and center-left parties would win 45 seats, while the two Arab lists would win 11 mandates, the poll shows. After the Likud and Blue and White party, the third largest party, if new elections were held today, would be Labor with 10 seats. The far-left Meretz faction would win five – the same number it won in 2015 – and the two Arab lists would win a combined 11 seats – seven for the Hadash-Ta’al list, and four for the United Arab List-Balad ticket. Gesher, the party of former Yisrael Beytenu MK Orly Levy, would fail to pass the minimum threshold. Yisrael Beytenu would also fail to pass the threshold. The center-right Kulanu would win four seats if new elections were held today, as would the haredi Shas party. The United Torah Judaism faction would win seven seats, as would the Union of Right-Wing Parties and the libertarian-leaning Zehut. The New Right would win five seats.